It’s not often any of us at Entertainium are playing the same games around the same time as each other. We’re usually off playing completely different games that we rarely get the chance to collaborate. Metal Gear Solid 5: The Phantom Pain is one of those rare exceptions… mostly. I was originally assigned to review The Phantom Pain, but a save game bug prevented me from finishing it. It was around that time my colleague Eduardo started playing it himself, so given how much fun we had putting together that piece on Bloodborne earlier this year, I figured we might as well do the same with Metal Gear. So for the past few weeks, Eduardo and I have been chatting about our experiences with the game. We both concluded that, while it’s a fine game, it’s a bit too long and barren. Callum: My experience with Metal Gear Solid 5 was… mixed. It started off well enough. The open world provided a veritable sandbox of possibilities, seemingly letting you execute any idea you could think of. Was pretty fun to mess around with — well, as much you can while trying to commit to a non-lethal run. 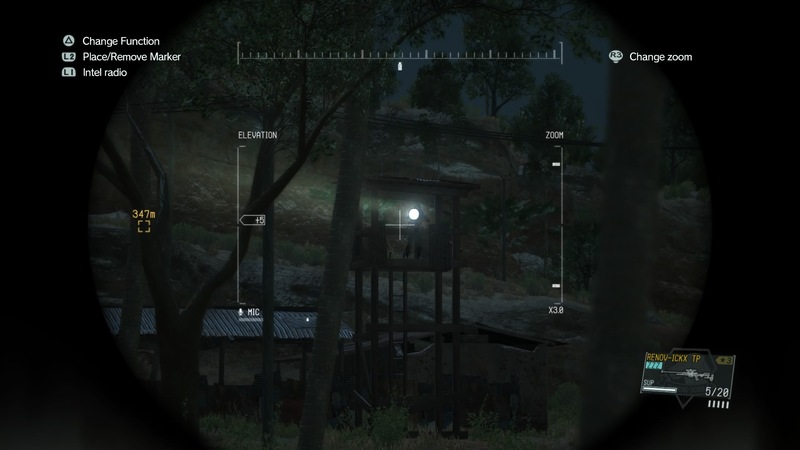 It makes a strong case for how stealth can work in open world settings. Seemed like an odd concept at first, given that part of the reason stealth works at all is because the levels are constrained and specifically designed around sneaking, but it worked well. Except for the part where the zones are lifeless and empty, anyway. I was enjoying the game quite a lot during the first 15 hours, but by then I also started feeling fatigue. I hadn’t gotten very far, but I’d already been repeating a lot of the same mission types, infiltrating the same strongholds and checkpoints. The game quickly went from being new and exciting to merely repeating the same strategies again and again. I suppose that’s my fault for not trying to mix things up, but I had no incentive to do so. Stealth was easy to pull off and often rewarded me better than a more combative approach, what with you being able to recruit enemy soldiers and all. The more I played the game, the less I felt compelled to continue because it only became more monotonous and repetitive the longer it dragged on for. I though the story missions would provide a change of pace from the side-ops, but the majority of them didn’t feel that different. They were basically just side-ops with a more fleshed out premise. The entire game just felt like a giant slog the more I played it. A shame, too, since it started off well. Eduardo: It took me a while to get into the game as well. That goes for every Metal Gear game since Solid for me, though. The intricacies of these games always take a little while to grow accustomed to, and since MGS V is so much different from the rest, it ended up not being an exception to that rule. Then again, once I finally “clicked” with it, around five or so hours in, I had my share of fun with it. The open world really helped flesh the game out for me, but at the same time, it’s probably its biggest detraction. I wholeheartedly agree with your opinion of how lifeless the maps feel. The side ops helped them breathe a little, sure, but nothing outstanding. Honestly, I was sorta holding there would be a bit more terrain variety too. Only having two areas that are pretty much only set apart by their weather patterns really starts to drag by the half way point. You’ve got a point in regards to the things you do in the game. They do get repetitive. Yeah, they tried to vary things up by say, putting soldiers in mechanized units and such, but by that point in the game, I was already well equipped to deal with them with little to no negative consequences to gameplay. It would’ve been nice to see a little more effort coming in from the opposition, other than throwing more and more soldiers at you. That negative aspect is made even more evident if you’ve made it to one of the game’s last missions, which pretty much throws stealth out the window in favor of pure combat where you’re outgunned and forced to play in a way that’s not at all akin to what Metal Gear is built upon: tactical espionage. Still, other things in the game helped keep it fresh. I for one enjoyed the progression in weapon and equipment development. As a big fan of Peace Walker, I was psyched to see the Fulton extraction system making a comeback in V. Sure, seeing one of my S/A+++ soldiers die in an off-screen mission in my late game was heartbreaking, but the aspect of finding an even better recruit while in a mission had me scanning every single fool out in the battlefield. With that in mind, that aspect of the game brings me to a part of it I tried my absolute best to avoid: the online component. Even though it’s not mandatory to the single player game, it’s there to be played and probably ate up a huge chunk of my base’s cash thanks to the Forward Operating Base – FOB – invasions. Did you give any of those modes a go at all — Metal Gear Online or FOB fights? Callum: So the game does sort of adapt to how you play. Like, if you perform a lot of headshots, the enemy will start wearing helmets more often. If you use sleeping gas, they’ll start wearing gas masks. The impact those have is minimal in practice — you can easily fire tranquilizer darts anywhere else on their bodies and they’ll still work, or you can remove that equipment entirely by disrupting shipments though deployment missions — though I appreciate that they tried to take that into account. Especially the addition of idle chatter between enemies that reflect how you’ve been playing. I once heard a couple of them talking about how there this guy running around putting everyone to sleep. It’s the little touches like that what I like most about the game. I didn’t mind the lack of terrain variety so much. I mean, the game could have had several environments and that still wouldn’t make up for the uninteresting mission design. What they needed was something to make those spaces interesting to be in. As it stands, the only points of interest are the checkpoints and compounds, and you come to master infiltrating them quickly due to how often you revisit every location on the map. The locales may be barren, but they can still create some striking shots. And like, I don’t mind mostly empty spaces. There are games built entirely around that and I love them. But they at least give you something — sights to see, events to take part in, an interesting landscape worth exploring. Metal Gear doesn’t provide anything. It’s landscapes are barren and boring. I didn’t ever want to just stop and take in the sights or enjoy roaming around on foot because I liked exploring them. I just wanted to get the next mission and be done with it. It reminds me a lot of early open world games I played and how they always frustrated me by how much of a chore it was to get around. Only here, it’s got the extra frustration of a lifeless, uninteresting space on top of it. On the subject of the online, I tried them both the FOB missions and Metal Gear Online. The FOB missions were cool in theory, but in practice, they’re no fun. Every base I tried to invade was always so armed to the teeth that there was no possible way for me to succeed. I could have all the best equipment available in the game and I still wouldn’t be able to make it past the first strut due to the sheer number of soldiers and drones firing at me. Likewise, it felt pointless to defend any bases because their security measures were so strong that I didn’t need to be there. I love the idea of infiltrating player-built structures, but they’re an exercise in frustration more often than not. The reason invasion mechanics work in something like Dark Souls is because, even when you fail, there’s always the sense that you can win. That it isn’t a hopeless battle (even if it actually is). Metal Gear doesn’t provide the possibility of success. Unless you’re attacking a base with hardly any defenses (and thus hardly any resources to steal), you’re basically guaranteed to lose. And that robs the mode of any reason to participate apart from building your own defenses. 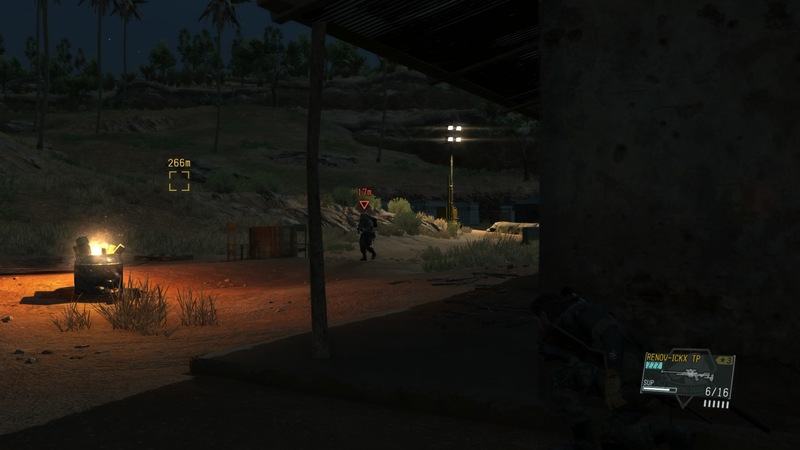 Metal Gear Online seemed okay. It’s a standard multiplayer shooter with Metal Gear mechanics slapped on top of it. I like how they were able to lay that template onto a proper competitive mode — it’s really funny to see people getting fultoned out of the arena — but I wasn’t interested enough to play more than a couple of matches at most. Mainly because I just don’t have much interest in multiplayer shooters these days. Eduardo: Oh, definitely. I really appreciated all the improvements to enemy behaviors and their upgrades in equipment. It made me go an extra mile to take a much more “in your face” approach to stealth without relying on guns or gadgets. 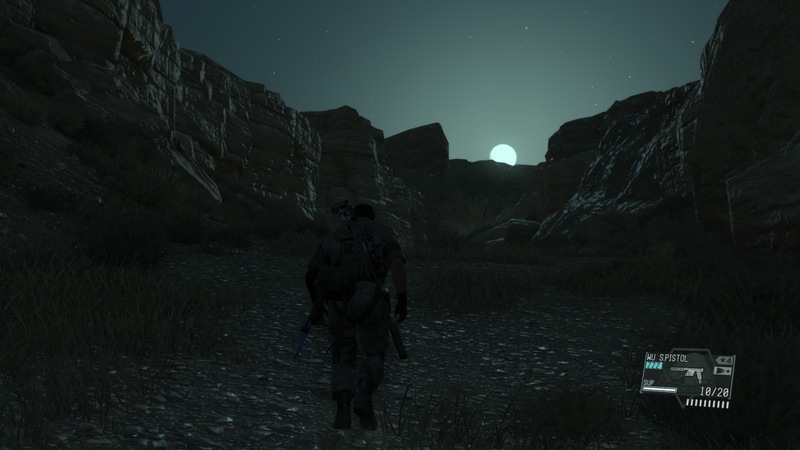 You make some good points on the overall barren nature of MGS V‘s locales. It was quite disheartening to go back to places repeatedly and see that your previous efforts in clearing were basically in vain. Still, without taking that local weirdness into account, the encounters were entertaining, at least, for the most part anyway. I totally agree about the missed opportunity with the online portion of the main game. I’ve grown to like the invasion mechanics in Dark Souls and Bloodborne, and I really think this game would’ve benefited from something like that instead of what we got. I gave it a few shots but eventually gave up. It isn’t awful, it’s just not what I’m looking in a game like Metal Gear. And honestly, the worst part in the whole thing isn’t really related to playing online – it’s having your game online whether you like it or not, and thus losing supplies and cash because of it. It’s really annoying. But let’s make a quick swerve back to the main game before going closing this out. Did you make much use of any of the D-buddies in the game? D-Dog was my favorite, but I’ve grown to like Walker a bunch after finishing the main missions. Any fun stories? Callum: I stopped playing before playing online became mandatory (that save game bug on PS4 got me), but yeah, that stuff is awful. I can understand wanting people to be online to make full use of the game’s features, but punishing people for not doing so — or for being disconnected due to circumstances beyond their control — is unjustifiable. Ugh. No stories of note with regard to the buddies. I found D-Dog to be the most useful of the bunch since he’s basically a radar. Very handy for stealth. Everyone else I found to be useful only in select cases, D-Walker especially since it’s basically made exclusively for combat. Helpful against the Skull Unit, but not much else in my case. I didn’t find much use for Quiet, since I was usually avoiding detection entirely whenever I was infiltrating a base or encampment. Heard plenty of stories about people using her to create distracts while they sneak by in the confusion, which is cool, but I never felt compelled to experiment much. No real point to given how easy it is to work out a viable, repeatable strategy. I feel like I’m at a point where long, sprawling games don’t appeal to me anymore. Open worlds are fun and all, but there are so many games that use them these days that it’s hard to stay engaged with them for long unless there’s something especially noteworthy about them. These kinds of games are always so long and packed with stuff to do that it’s easy to get burnt out on them. It’s why I’ve grown to greatly prefer shorter, more concentrated works. Not only are they easier to make time for, but they know when to end. Phantom Pain feels like it didn’t know when to end. And when it does it feels… sudden — unearned. It’s like they finally realized they needed to end the game and quickly attached the ending onto the end of Act 2 because they didn’t have anywhere else to put it. For as critical as I am of Phantom Pain, I do want to reiterate that I did enjoy a good portion of my time with it. The stealth is fun and exquisitely designed and the variety of options it provides are incredible. It’s a veritable sandbox with nearly limitless possibility. If the game weren’t so long, I’d have probably enjoyed it far more since I wouldn’t have gotten so sick of it.